The nearby Wuxi High-Tech Zone – known as the Wuxi New District (WND) – offers a striking similarity; it’s a large and friendly smart city and has its eye focused on protecting its people in its role as the first and only national innovative demonstration zone for the IoT industry. WND is focused on building an intelligent and green big data application ecosphere, coupled with new IoT analytics from SAS to promote business growth. It’s an innovative new model in which the Wuxi local government serves up analytics for the vast number of businesses located there. Smart cities often focus on a variety of elements to provide their citizens with a high quality of life, including safety and security, efficiency of resources and economic development. In cities across China, however, the goal of economic development surpasses the other goals considerably. The idea is that if you have a strong economy, including international investment and growing local businesses, the other goals, including sustainability, will follow. Wuxi is a national experimental base in China; nearly 2,000 IoT companies, with revenues of more than RMB 200 billion ($29.2 billion), more than 150,000 employees, and an industrial chain covering sensors, network communication, platforms, applications and infrastructure are located in Wuxi. SAS is a committed partner with Wuxi in providing a full range of technical services and great value in areas related to IoT. To that end, Wuxi is using SAS Analytics for IoT, which comprises SAS data visualization, data mining and machine learning technologies, and SAS® Event Stream Processing. SAS Event Stream Processing analyzes high-velocity IoT devices, networks, applications and data in motion to enable meaningful and immediate actions and decisions for the organization. During a recent visit, I heard a variety of Chinese leaders from government, as well as Chinese and International companies, speak about the importance of IoT investment, including companies like Alibaba and Astra Zeneca. The application of IoT analytics transforms real-time sensor data into crucial insights and actionable information that can help local, regional and national leaders make better decisions. These decisions can be further automated using artificial intelligence algorithms, including advanced machine learning and deep learning technologies applied to the streaming sensor data in motion. IoT is the future, and a big component of the Chinese strategy is to encourage its young people to participate in the IoT economy. In keeping with SAS’ long-standing commitment to help improve education at all levels around the world, SAS co-sponsored the Feifeng Digital Innovation Competition. The theme was “Smart City,” and more than a thousand young people submitted projects for application development and real-time data analysis from the Hongshan IoT town. The value of the platform approach. Developing an analytics platform approach allows the Wuxi High-Tech Zone to take the variety of real-time sensor data, combine it with other available data, and apply it to numerous use cases with the right analytics methodology in place. With rare exceptions, other international smart cities are taking more of a niche approach when it comes to analytics. Certainly, these cities are installing a variety of sensors, but when it comes to analytics, they’re not employing a platform approach. Instead, they have a narrow focus when it comes to analytics, and this limits their ability to discover new insights. The value of youth involvement. Including youth in IoT activities helps cultivate talent for the large number of Chinese companies planning to use the Feifeng platform to develop new IoT applications and technologies. SAS’ open platform vision will facilitate the development of these methodologies using open source technologies, but with robust, enterprise-grade platform capabilities. SAS and the Wuxi National High-Tech Zone are dedicated to the innovative application of China’s IoT analytic technologies, helping enterprises in pharmaceutical, manufacturing, utilities and transportation industries tap into big data. This partnership will help local and international businesses access market leading analytics, including artificial intelligence, machine learning and analytics that will keep pace with the real-time, rapid-fire nature of an IoT world. 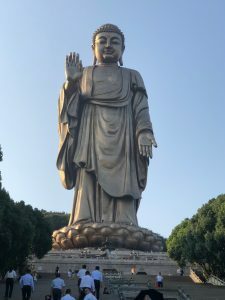 Wuxi wasn’t the only region I visited in China; but, like the nearby Grand Buddha at Ling Shan, it was unsurpassed in terms of far-reaching impact, especially the impact of IoT, to produce outstanding economic benefit for the region, China and the world. Lee Ann Dietz is an analytics evangelist for transportation and smart cities at SAS. She is currently a Principal Industry Consultant in the Global Government Industry Practice at SAS, and has almost 25 years supporting customers with analytical solutions. Prior to joining SAS in 2012, Lee Ann held various positions with Railinc, DZone, Inc., and SAS. Lee Ann began her career with American Airlines and SABRE, after earning her MBA from the Darden Graduate School of Business at the University of Virginia and BA (Economics) degrees from Stanford University.